Ingram Micro Inc. (NYSE: IM), the world's largest technology distributor and supply-chain services provider, today announced financial results for the second quarter ended June 30, 2012. Worldwide sales, which were essentially flat in U.S. dollars at $8.78 billion when compared with $8.75 billion for the second quarter last year, demonstrated relatively strong local currency growth in all regions. The translation effect of foreign currencies had a negative impact of 5 percent on worldwide sales growth as compared with the prior year. Worldwide gross profit was $452.7 million (5.16 percent of total sales), compared with $459.2 million (5.25 percent of total sales) in the 2011 second quarter. 2012 second quarter gross profit was lower than the year earlier period primarily due to a greater mix of sales in high-volume, lower margin products and in lower margin customer segments, as well as a competitive selling environment. - A positive impact from a net discrete tax benefit totaling approximately $4.4 million, or 3 cents per diluted share, recognized in the quarter as a result of the lapse of the statute of limitations and its impact on a taxrelated reserve in Australia, and positive adjustments resulting from the resolution of portions of an Internal Revenue Service audit in the U.S.
2011 second quarter net income was $59.7 million, or 37 cents per diluted share, which included a positive impact of a net gain of $2.6 million pretax, or 1 cent per diluted share, due to the foreign-currency translation impact on Eurobased inventory purchases in the company's pan-European entity. Further detail can be found in the financial statements and schedules attached to this news release or at www.ingrammicro.com. - North America's sales grew year-over-year for the 10th consecutive quarter, up 2 percent versus the year earlier period, driven in part by double-digit growth in the region's specialty businesses of DBL accessories, data capture/point of sale and physical security, as well as solid sales increases in the company's higher value enterprise technology offerings. - Sales in Latin America hit an all-time high for a second quarter growing 14 percent, despite a 13 percentage point negative impact to sales growth from the translation impact of weaker local currencies. - Asia Pacific sales were up 4 percent in U.S. dollars, but were much stronger in local currencies, considering the negative 5 percent impact to sales growth from the translation of weaker local currencies. Sales for the region reached an all-time second quarter high, driven by strong double-digit growth in China and India. - In Europe, while sales were down in U.S. dollars by 7 percent, demand was solid in local currencies led by double-digit growth in Germany and the United Kingdom. The translation impact of weaker local currencies negatively affected growth by 10 percentage points. - During the second quarter, the company purchased 2.7 million shares of Ingram Micro stock for an aggregate of $50 million. Since the 3-year, $400 million repurchase program was announced on Oct. 28, 2010, 15.2 million shares have been purchased for an aggregate of $275.9 million. - Working capital days were 25, within the company's targeted range of 22 to 26 days. "We had another solid quarter, with strong sales in many countries, particularly relative to overall IT spending," said Alain Monie, president and chief executive officer, Ingram Micro Inc. "We are executing on our strategic initiatives. We continue to invest organically in the business across all regions to fuel future accelerated growth in higher margin markets and the business is absorbing these investments while still generating solid operating margins. We are also delivering on our M&A strategy to accelerate our presence in high-growth and higher value markets, as we recently announced the signing of a definitive agreement to acquire BrightPoint Inc., a global leader in providing device lifecycle services to the mobility industry. We are moving the business in the right direction and we remain highly focused on driving further improvements across the company." Bill Humes, chief operating and financial officer, commented: "As illustrated by strong operating expense leverage, we are doing a good job aligning costs with the level and mix of sales in each region. Our relatively robust local currency growth rates are being fueled in-part by high-volume sales of lower gross margin products. The cost to serve these markets is low and the working capital dynamics and contribution margin are acceptable, leading to solid returns on investment. I am pleased with our performance in what continues to be a challenging selling environment throughout much of the world and look forward to our continued execution on our stated financial and strategic initiatives." For the six months ended June 30, 2012, worldwide sales were $17.4 billion, with gross profit of $920.3 million (5.28 percent of total sales), compared with worldwide sales of $17.5 billion, with gross profit of $913.3 million (5.23 percent of total sales) for last year's six-month period. Six-month net income for 2012 was $151.2 million, or 98 cents per diluted share, versus $116.0 million, or 71 cents per diluted share, for the 2011 six-month period. 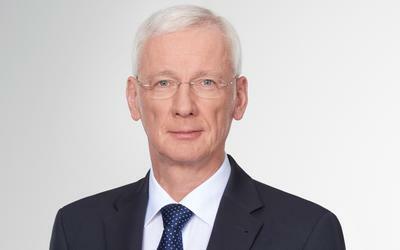 Given the current macroeconomic environment, the company expects sales for the 2012 third quarter to be flat sequentially with the 2012 second quarter and expects gross margins to remain under pressure. The company will also incur incremental interest costs of approximately $2 million in the third quarter associated with the bridge financing facility entered into at the time of the BrightPoint acquisition announcement. Additional information about Ingram Micro's financial results will be presented in a conference call with presentation slides today at 5 p.m. ET. To listen to the conference call webcast and view the accompanying presentation slides, visit the company's website at www.ingrammicro.com (Investor Relations section). The conference call is also accessible by telephone at (800) 369-2005 (toll-free within the United States and Canada) or (210) 839-8501 (other countries), passcode "Ingram Micro." (Investor Relations section) or by calling (888) 562-2781 or (402) 998-1437 outside the United States and Canada. The matters in this press release that are forward-looking statements are based on current management expectations. Certain risks may cause such expectations to not be achieved and, in turn, may have a material adverse effect on Ingram Micro's business, financial condition and results of operations. Ingram Micro disclaims any duty to update any forward-looking statements. Important risk factors that could cause actual results to differ materially from those discussed in the forward-looking statements include, without limitation: (1) we are dependent on a variety of information systems, which, if not properly functioning, or unavailable, could adversely disrupt our business and harm our reputation and earnings; (2) changes in macro-economic conditions may negatively impact a number of risk factors which, individually or in the aggregate, could adversely affect our results of operations, financial condition and cash flows; (3) we continually experience intense competition across all markets for our products and services; (4) we operate a global business that exposes us to risks associated with conducting business in multiple jurisdictions; (5) our failure to adequately adapt to IT industry changes could negatively impact our future operating results; (6) terminations of a supply or services agreement or a significant change in supplier terms or conditions of sale could negatively affect our operating margins, revenue or the level of capital required to fund our operations; (7) we have made and expect to continue to make investments in new business strategies and initiatives, including acquisitions, which could disrupt our business and have an adverse effect on our operating results; (8) substantial defaults by our customers or the loss of significant customers could have a negative impact on our business, results of operations, financial condition or liquidity; (9) changes in, or interpretations of, tax rules and regulations, changes in mix of our business amongst different tax jurisdictions, and deterioration of the performance of our business may adversely affect our effective income tax rates or operating margins and we may be required to pay additional taxes and/or tax assessments, as well as record valuation allowances relating to our deferred tax assets; (10) changes in our credit rating or other market factors such as adverse capital and credit market conditions or reductions in cash flow from operations may affect our ability to meet liquidity needs, reduce access to capital, and/or increase our costs of borrowing; (11) failure to retain and recruit key personnel would harm our ability to meet key objectives; (12) we cannot predict with certainty what loss we might incur as a result of litigation matters and contingencies that we may be involved with from time to time; (13) we may incur material litigation, regulatory or operational costs or expenses, and may be frustrated in our marketing efforts, as a result of new environmental regulations or private intellectual property enforcement disputes; (14) we face a variety of risks in our reliance on third-party service companies, including shipping companies for the delivery of our products and outsourcing arrangements; (15) changes in accounting rules could adversely affect our future operating results; and (16) our quarterly results have fluctuated significantly. We also face a variety of risks associated with our recently announced signing of a definitive agreement to acquire BrightPoint Inc., including: our ability to timely complete the transaction, if at all; our ability to complete the transaction considering the various closing conditions, including those conditions related to regulatory approvals and BrightPoint shareholder approval; the financial performance of BrightPoint and Ingram Micro through the completion of the merger; BrightPoint's business may not perform as expected due to transaction-related uncertainty or other factors; the ability of BrightPoint and Ingram Micro to retain relationships with customers, vendors and carriers; management's ability to execute its plans, strategies and objectives for future operations, including the execution of integration plans; growth of the mobility industry; uncertainties relating to litigation, including pending and future BrightPoint shareholder lawsuits related to the proposed or completed transaction; and other unknown, underestimated and/or undisclosed commitments or liabilities; our ability to maintain access to adequate levels of capital at reasonable rates and to enter into and consummate the senior unsecured bridge loan facility for up to $300 million for which we have entered into a commitment letter; and our ability to achieve the expected benefits and manage the expected costs of the transaction. Ingram Micro has instituted in the past and continues to institute changes to its strategies, operations and processes to address these risk factors and to mitigate their impact on Ingram Micro's results of operations and financial condition. However, no assurances can be given that Ingram Micro will be successful in these efforts. For a further discussion of significant factors to consider in connection with forward-looking statements concerning Ingram Micro, reference is made to Item 1A Risk Factors of Ingram Micro's Annual Report on Form 10-K for the fiscal year ended Dec. 31, 2011; other risks or uncertainties may be detailed from time to time in Ingram Micro's future SEC filings. As a vital link in the technology value chain, Ingram Micro creates sales and profitability opportunities for vendors and resellers through unique marketing programs, outsourced logistics, technical and financial support, managed and cloud-based services, and product aggregation and distribution. The company is the only global broad-based IT distributor, serving 145 countries on six continents with the world's most comprehensive portfolio of IT products and services. 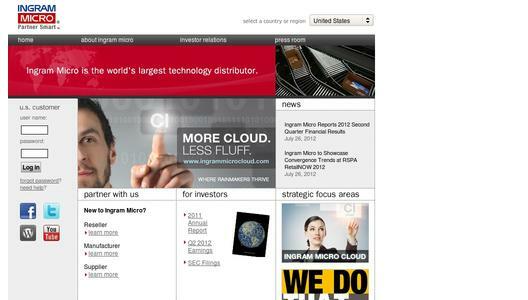 Visit www.ingrammicro.com.